Well, that was a waste of three days. Since Friday, Senator Chuck Schumer and Senate Democrats shut down the government and promised they would not vote for a continuing resolution spending bill without the passage of a DACA bill. After shutting down the government for three days today Sen, Schumer gave Senate Democrats permission to pass a continuing resolution spending bill without the passage of a DACA bill. The stoppage was called the Schumer shutdown. Today’s vote to end the filibuster will be known as the Sen. Schumer Surrender. 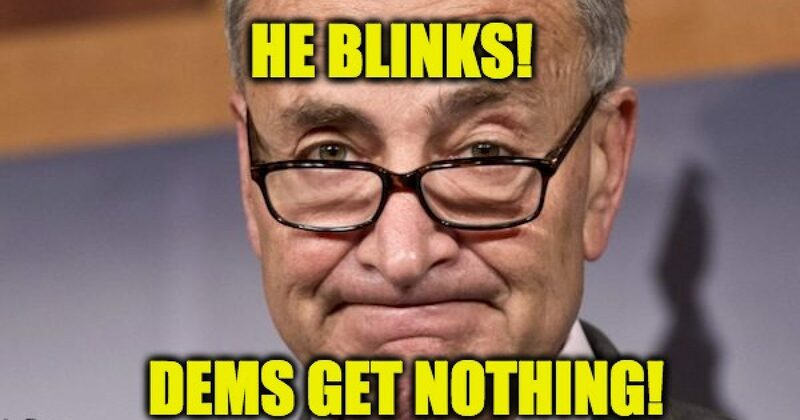 Sen. Schumer can deny it all he wants (he’s good at lying) but the real truth is that he blinked. Perhaps it was the polls showing Americans were blaming him, or perhaps it was pressure from his members running for reelection, or perhaps someone pushed his glasses up to where they should be and Schumer realized he was in the wrong, but in the end, the senator gave in. Can someone clearly state what exactly Chuck Schumer extracted from McConnell by shutting down the government? Pretty weak outcome for the Democrats — they couldn’t get a summit meeting with Trump/GOP leaders or promise to attach DACA fix to a must-pass bill — but they were worried about the lack of a clear endgame and McConnell wasn’t budging on concessions. If this was always Senate Democrats’ exit strategy – cave in exchange for nothing – they should have just provided the 8 votes on Friday. Was fairly predictable that Dems would get rolled. They didn’t have a much of a bargaining position. I wonder if Dems understand how much of their base will be demoralized by accepting this deal. Last week Sen. Schumer said negotiating with the President was like negotiating with Jell-O. But considering the fact that the President stared him down, what America learned is that when Sen. Schumer takes a hard stance it’s as hard as a tower of Jell-O.